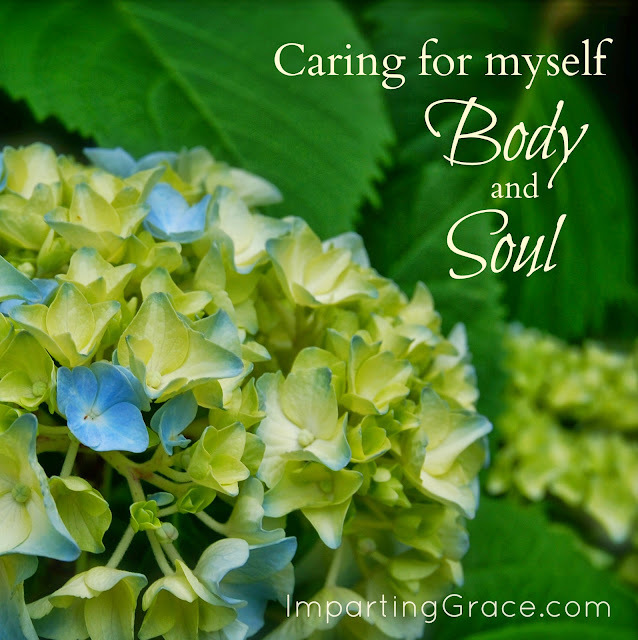 Imparting Grace: Caring for Myself Body and Soul 1:Why think about this? Why write about caring for myself? Isn't that a little--ahem--self-centered? Even selfish? That's what I used to think. I was getting the idea of care mixed up with pampering and indulgence. They're not the same at all. Sure, caring might involve occasional pampering. But truly caring for myself is not at all self-centered. In fact, I think truly caring for myself is about being set free from self-centeredness. To care for someone means to pay attention to his or her health and well-being. Beyond that, though, real care is considering the object of one's attention to be worthy of care and acting on that belief. And that's a stumbling block sometimes. So for me, the first step in caring for myself must be the realization that I am worthwhile. I am worthy of care. You are worthy of care. That's God's view on the matter. We are God's creation, made in God's image. We are God's beloved. At least a dozen times I've heard the illustration of a flight attendant's instructing adults to put their own oxygen masks on first, then assisting children with theirs. Speakers and writers with very good intentions use that story to signify that those of us who care for others must be sure to care for ourselves first. It's a good illustration in many ways. However, I'm afraid that illustration underscores what many of us secretly believe about ourselves. We have the idea that we're valuable only in terms of the jobs we're able to perform. That we should take care of ourselves just so that we'll be able to care for others. Or that we should take care of ourselves so that we can do our best at our jobs. This reminds me of the proper "care" of engines. We take care of our engines because we need them to run. When they stop running, they are no longer of value. People are not engines. 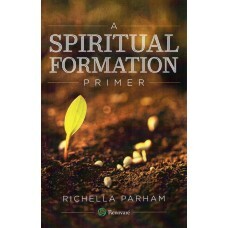 Each human being is a living soul, of great and lasting value to God. While our work is important, our care for ourselves should not be limited to the idea that we're equipping ourselves for performance. Most of us have work to do, of course. But we're worthy of care even if we're not able to work, not able to perform, not able to do. Instead, I'd like to learn to care for myself out of respect for the fact that I am an unceasing spiritual being, deeply loved and cared for by God. So this month I'll be exploring ways to care for myself, body and soul, in big ways and small. What do you think? Do you need some care, some nurturing? Do you know you're worthy of care? Looking forward to this series...I am definitely in need of some self-care - will be anxiously awaiting your next post! Looking forward to spending the month with you!! God's timing is something I always stand in awe over. At my annual physical just last month my health showed signs of lots of problems. Every year before I had left with the doctor saying "you are healthy as a horse, see you next year". This year mammogram, brain scan, pelvic ultrasound, high cholesterol, sleep issues, heartburn. After worrying the month of August away I have come to the conclusion that I am in need of some self care. That these issues were self induced and thank God most of the tests are normal or have a simple "fix". God now has me on a tight leash with a choke collar and this week at least daily if not more than once in a day has He given me posts like yours, scripture, examples of pulling away and taking care of myself. Hopefully, I can follow along with you and give God the glory in the journey. Thank you. I cannot count the number of times someone has said to me, "And what about you? What are you doing for self-care?" It is as if your "Caring for Myself: Body and Soul" series was meant just for me, and you are the instrument through which our Savior is sending His message to me. That sounds self-centered.... But it is how I feel. Blessings as we go on this journey with you, Richella. Thank you for the good post Richella. As women we tend to take care of everyone else and neglect ourselves don't we? I'll look forward to your hearing what you find on your self-care exploration this month. With Fall in full swing I had already made the commitment to schedule in all the things that are important just for me . . . quiet time, exercise, planning more low cal meals, etc. . . so I'll be on the journey with you! Yes, yes, yes! So looking forward to this, Richella. Think of your body as being healthy, and make your mind healthy using your body ! Caring for Myself Body and Soul 7:Saying "No"